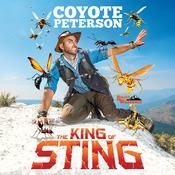 Coyote Peterson, host of the Brave Wilderness YouTube channel and the Emmy Award–winning show Breaking Trail, is an avid adventurer and animal expert. Since childhood, animals have played a huge role in his life. Every one of them, from the bizarre to the deadly, have led him on countless pursuits to understand their true nature and develop an appreciation for the incredible habitats they call home. His goal is to make animal conservation and education entertaining for the next wave of explorers and to further promote compassion and welfare for the natural world through the curiosity it provokes.